It’s not often that you’re given the chance to write a television commercial based on a classic Randy Travis country song. Billionaire business legend Phil Anshutz (oil, real estate, railroads, telecommunications, professional soccer and basketball teams) began The Foundation For A Better Life with a unique, singular purpose. 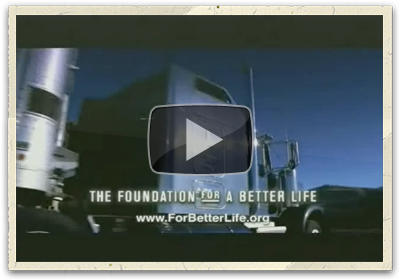 He wanted to produce a series of public-service TV spots that would encourage all of us to live better. Each commercial took a one simple moral theme – like “fidelity”, for example – and expressed it with a real-life short story. It was always the kind of story many could relate to. Be inspired by. Be taught by. In the example included here, Randy’s memorable hit about maturity (“Spirit of a Boy, Wisdom of a Man”) is transplanted into a truck stop. Basically, we just let the lyrics tell a tale about faithfulness. Check it out. We think it may be the most powerful message we’ve ever been privileged to create.